Expressionist, he never fully abandoned the depiction of the human figure. His paintings of women melt together figure and ground through a process of dismembering, re-assembling and distorting. like records of a violent encounter, rather than finished works in the old Beaux Arts tradition of fine painting. personal, obviously based on feeling over intellect and very probably arousing from some “primal event” (as Freud might term it) in his early life so traumatizing that the artist buried it into his unconscious but eventually let it come to the surface when painting. According to Freudian interpretations everyone’s image of women is formed by one’s first contacts, generally with the mother. De Kooning’s parents were divorced when he was five. Originally with the father, his mother fought for and won the right to his custody. 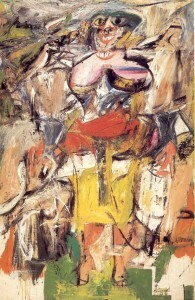 Apparently de Kooning’s mother was head-strong, devouring and manipulative. In such an environment, the artist could easily develop an unease growing into fear perhaps, repulsion, even hatred of his mother not unmixed with a desire to love and be loved by her — again, she is, after all, his mother — just as later on he would transfer this anguish to women generally, combined with a natural sexual and emotional attraction to, and need for, them. It seems that de Kooning may be experiencing a not uncommon emotional situation regarding women, wherein the male is torn between two attitudes. In one, he may place a woman on an impossibly high pedestal of perfection, creating an idealized being of such purity, that he is unable to significantly relate to her sexually or emotionally. On the other hand, he may regard her as something appropriate to be used for his lust but not worthy of his love or respect. but depraved, alluring but dangerous, disillusioning and disappointing in their fall from the pedestal…and therefore must be symbolically destroyed.